"The Band-tailed Pigeon is called by the Chinook Indians 'akoigh homin.' It ranges from the eastern spurs of the Rocky Mountains across to the Columbia river, where it is abundant. It arrived in 1836 in very great numbers, on the 17th of April, and continued in large flocks while breeding. Their breeding places are on the banks of the river. The eggs are placed on the ground, under small bushes, without a nest, where numbers congregate together. The eggs are two, of a yellowish-white colour, inclining to bluish-white, with minute white spots at the great end. These Pigeons feed upon the berries of the black elder and the buds of the balsam poplar. When sitting in the trees, they huddle very close together in the manner of the Carolina Parrot, and many may be killed at a single discharge of the fowling-piece. The flesh is tender and juicy, and therefore fine eating." Mr. NUTTALL has favoured me with an equally interesting notice. 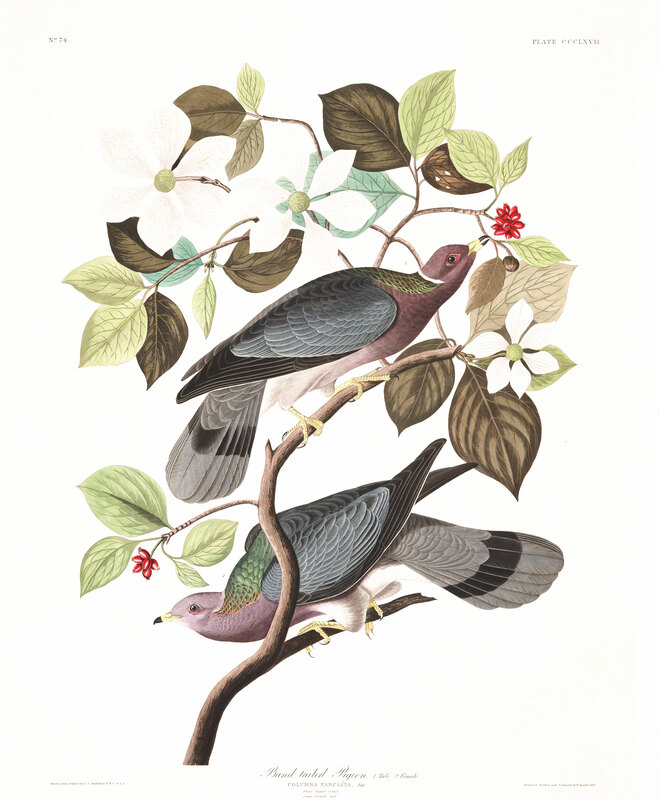 "This large and fine Pigeon, always moving about in flocks, keeps in Oregon only in the thick forests of the Columbia and the Wahlamet, and during the summer is more particularly abundant in the alluvial groves of the latter river, where throughout that season we constantly heard their cooing, or witnessed the swarming flocks feeding on the berries of the elder tree, those of the Great Cornel (Cornus Nuttalli), or, before the ripening of berries, on the seed-germs or the young pods of the balsam poplar. The call of this species is somewhat similar to that of the Carolina Dove, but is readily distinguishable, sounding like a double suppressed syllable, as h'koo, h'koo, h'koo, h'koo, uttered at the usual intervals, and repeated an hour or two at a time, chiefly in the morning and evening. They are said to breed on the ground, or in the low bushes, but I did not find the nest, although I saw the birds feeding around every day near Watpatoo Island. During the whole of this time they keep in flocks, either in the poplars or elder bushes, and on being started, sweep about like flocks of domestic pigeons, soon returning to their fare, when they feed in silence, keeping a strict watch for intruders. They remain on the lower part of the Columbia nearly the whole year, late in the season (October and November) feeding mostly on the berries of the tree cornel, but still they seem to migrate some distance to the south, as the severity of the winter approaches." COLUMBA FASCIATA, Say, Long's Exped., vol. ii. p. 10. COLUMBA FASCIATA, Bonap. Syn., p. 119. BAND-TAILED PIGEON, Columba fasciata, Bonap. Amer. Orn., vol. i. p. 77. BAND-TAILED PIGEON, Nutt. Man., vol. i. p. 624. BAND-TAILED PIGEON, Columba fasciata, Aud. Orn. Biog., vol. iv. p. 479. Male, 16, wing, 9. Female, 15 1/2. From the eastern spurs of the Rocky Mountains, and across them to the Columbia river. Common. Migratory. Bill straight, rather short, slender, compressed; upper mandible with a tumid fleshy covering at the base, where it is straight in its dorsal outline, convex towards the end, with a sharp-edged, declinate, rather obtuse tip; lower mandible with the angle long and pointed, the sides erect at the base, sloping outwards toward the end, the edges sharp, the tip narrow but blunt. Nostrils medial, oblique, linear. Head small, oblong, compressed; neck of moderate length; body full. Feet short, strong; tarsus very short, rounded, with two anterior rows of large hexagonal scales; the hind part fleshy, with very small scales; toes broad and flat beneath, marginate, with large scutella above; the hind toe smallest, the lateral nearly equal, the middle toe much longer. Claws of moderate size, arched, compressed, grooved beneath, rather acute. Plumage rather compact above, blended beneath, on the hind neck strong, with metallic gloss. Wings long, the second quill longest, the third only a twelfth of an inch shorter, the first six-twelfths shorter, and a little longer than the fourth, the rest rather quickly graduated; secondaries of moderate breadth and rounded. First quill with the outer web narrower at the base than toward the end, the second and third quills with their outer webs having a slight sinus and attenuated toward the end. Tail of moderate length, rounded, of twelve broad abruptly rounded feathers, of which the lateral is half an inch shorter than the longest. Bill yellow, with the tips black. Feet yellow, claws greyish-black. Bare space around the eyes carmine. The head, fore neck, and breast are of a light reddish-purple or wine-colour, which on the abdomen and lower tail-coverts fades into whitish; a narrow half-ring of white on the hind neck, the lower part of which is of a metallic brownish-green tint. The upper parts are greyish-blue, darker, and tinged with brown on the fore part of the back and scapulars; sides of the body and rump greyish-blue. Alula, primary coverts, primary quills, and outer secondaries brownish-black, very narrowly margined with brownish-white. Tail greyish-blue at the base, much paler and tinged with yellow toward the end, these colours being separated at the distance of two inches from the tip by a band of black. Length to end of tail 16 inches, to end of wings 13 3/4; wing from flexure 9; tail 6 1/4; bill along the ridge 10/12, along the edge of lower mandible 1 1/12; tarsus 1 1/12; hind toe 8/12, its claw (5 1/2)/12; middle toe 1 (4 1/2)/12, its claw 7/12. The female differs from the male only in having the tints a little duller, and on the upper parts somewhat darker, with the black band on the tail less decided, the middle feathers being but faintly marked with it. Length to end of tail 15 1/2 inches. This very beautiful tree, which was discovered by Mr. NUTTALL on the Columbia river, attains a height of fifty feet or more, and is characterized by its smooth reddish-brown bark; large, ovate, acuminate leaves, and conspicuous flowers, with six obovate, acute, involucral bracteas, which are rose-coloured at the base, white towards the end, veined and reticulated with light purple. The berries are oblong, and of a bright carmine.